This is a new work and Tablo-readers like you are among the first to see it! It goes without saying that no part of this work can be copied or taken and posted anywhere else without permission. I'll be publishing updates every Sunday, Wednesday, and Friday, and I'd love to hear your feedback and suggestions. I hope you'll let me know what you like or don't like. Your support is appreciated. 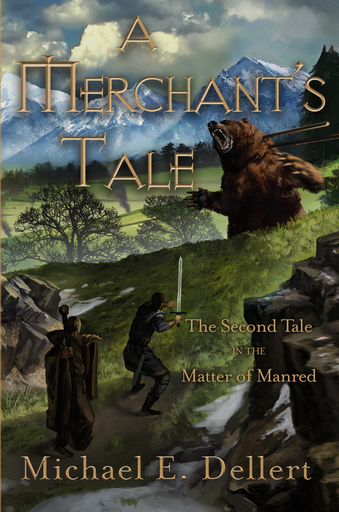 I hope you'll also have a look at Hedge King in Winter, A Merchant's Tale, and The Romance of Eowain, the first three books in the Matter of Manred Saga. They're all available as complete, published books on Amazon! Thanks for reading! I hope you enjoy The Wedding of Eithne. Inloth leaned on his walking stick, primmed his lips, and groaned. His hips were sore. His shoulders were stiff. His back ached in places he hadn’t known existed. No matter how he twisted his neck, he couldn’t get a crack to relieve the pain. Hmph, he grumbled. Maybe willow bark tea this evening. Rain trickled from the leaden sky that hung like a doom over the northern mountains, but the air at last befitted a spring day. Inloth fussed with his woolen cloak. Better than yesterday, thank Belenos. Frigid winds had fallen from the still-snowy heights through the night. Nothing worse than a bone-chilling wind through rain-soaked blankets. The weather was just another of the wretched difficulties from which Inloth and his band of pilgrims had suffered on their long journey. Since setting out from the southern coast more than a fortnight ago, robbers and bandits had harassed them, and chieftains who were little better than both had taxed them. The changeable spring weather had teased them with summer’s warmth before plunging back into a wintery mix of rain and cold. Faith and courage had seen Inloth and the eleven priests of his mission through it all, but many of the pilgrims who’d set out with them had deserted along the wayside. That morning’s gruesome march had been particularly difficult. Some battle had been fought—that very morning, said the ragged survivors they’d met—along the trail. Deserters skulked among the pine branches and the oaks coming into their spring leaves. Fresh corpses littered the trail, mangled and crow-plucked. More manly scavengers filched boots and coins from the bodies. His heart sickened to see the aftermath of so much violence. “Your Reverence?” Finntonn, one of Inloth’s assistants, tugged at his elbow. “Who are those men?” Not a young man, being nigh on thirty summers old, his head was shaved save for the tawny hair pulled up into a top-knot. Rain-water dribbled in rivulets from his bald scalp as he raised a hand into the distance. Dark-haired men wearing the heads of wolves and wildcats for hoods picked through the carnage. Clad in brown and black leather harness, they arrested survivors, and put those beyond saving to a merciful end with swords and javelins. Snatches of song, somber and grave, drifted through the rain. Blue-robed priestesses roamed the battlefield with herbs, poultices, and linen bandages. They chanted the healthful prayers of the Abred-Mother as they bound the wounds of the survivors. Inloth noted the tartans among the dead bodies. Most had none to identify their kindred and seemed like nothing more than lordless brigands. But others wore colors that caught his eye. A long line of some three-score warriors in tartans of white and red stood idle along the trail ahead. “Mind yourself. More Cailech-men,” whispered Inloth as they picked their way past. Ragged and sullen-eyed, the tribesmen fingered their weapons and appraised the pilgrims like hungry wolves. Inloth swallowed a knot in his throat, blessed them as he passed, wished them peace. His junior priests took him for a model and did the same. At the head of the column, a man in furs and tartans kneeled over one of the slain. The corpse had once been a stout fellow, a stern warrior in life no doubt. Inloth noticed the eyes had been plucked from the head. “I’m sorry for your loss.” Inloth made a blessing over the corpse to speed the soul on its way to the otherworldly feast of Tirn Aill. “Thank ye, Drymyn.” The brute laid a meaty hand on Inloth’s shoulder. “I’m Dunchath, King of the Cailech. Find our camp in the Vale and I’ll be glad to repay yer kindness.” He spat in the direction of Huntsmen who had taken a red-and-white tartaned survivor into custody. “It’s more’n these bastards’ll do for him.” Then he turned to his men, barked an order—“Burial detail!”—and marched away down the column. Inloth led his pilgrims on through the carnage. The Huntsmen took other Cailech-men into custody, and a handful of the lordless brigands as well, but never the Droma-men, Inloth noticed. Then, at the top of the pass at last, he set his eyes upon the village of the Vale. Or rather, what the village became once a year. The village itself was a tiny collection of houses and a few shops, not unlike a hundred other hamlets in the Five Kingdoms. But for these few days of the feast of Cétshamain, the village swelled out into all the surrounding fields. Everywhere, people rushed about their business. Pavilions were pitched, market stalls sprang up. Carpenters built stands beneath awnings so the nobility could watch contests in comfort. Targets were erected for archery, a sand floor made for the swordsmanship duels, a circuit drawn for chariotry. Paddocks appeared, as did wattle pens for ducks and swine, sheep and kine. Butchers sharpened their knives, and ovens were built brick by brick. Finntonn nodded and directed the other ten priests to their duties. The pilgrims knelt in the rain. Together, Inloth and his twelve priests sang the paeans to their sun-god, Belenos, and the pilgrims responded. In the Old Tongue of their forebears, the words of their song whispered through the trees and the rain. On and on their voices droned. They sang the paeans, they praised Belenos, they recited the appropriate verses from the sacred scrolls, and they prayed the proper prayers of their wise men. A weary cheer for their god arose from his pilgrims. Despite their losses, new pilgrims had joined their cause along the High King’s Road. Altogether, he was proud to bring some eighty followers of Belenos, including the younger priests, not to mention pack-mules and carts for what remained of their meager belongings and supplies. Five men and three women, his most zealous followers, walked together in a knot nearby, with girdles of brass-studded scourges wrapped around dark blue robes over thick goats-hair shirts. Each wore a smile, as always, and in spite of their weariness and the surely nettling hairs of their small clothes. “Indeed, we’re eager to spread the Light.” The ginger-haired lass with the curled tresses, Tnúthét, clasped her hands before her and stood a-tiptoe. “So may we begin, Your Reverence?” Eagerness lit the face of blonde Trebithu. “Oh, we will, Master, we will,” the three women assured him, and led their little band of eight on ahead. He waved the staff forward and hoisted his pack—Oww! A stab of pain ran through him. Damn it all. He grimaced and rubbed at the base of his spine. Willow tea this evening, for certain. Please don't forget to vote, tweet, post, pin, share, and otherwise help get the word out about this exciting new Adventure in Indie Publishing! A few simple clicks can make a world of difference! Want to learn more? Check out the book page on my website at MDellertDotCom/blog/The-Wedding-of-Eithne. 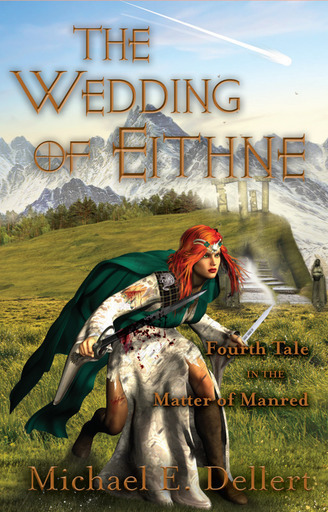 Look out for the next installment in this Continuing Tale in the Matter of Manred: The Wedding of Eithne! New episodes post every Sunday, Wednesday, and Friday! And by all means, let me know what you think. I'm still a few months from publication, and I can use all the help I can get to make this story even better! As if through the fog of a dream, the white marble stone walls rose to a cathedral’s height over Eithne’s head. The grotto was twice as long as it was wide, bordered by a double row of columns on each side, columns of true wood that put out leaves like natural living trees. Eithne tried to blink, to shake her head, to rid herself of the fog over her mind. At one end of the grotto rose a circular white marble platform, a single step high. Upon it, a yard-wide cauldron yawned. It gleamed with the white glint of a metal that was somehow both silver and gold at once, while forever being neither. Beneath it, a fire had been kindled, and steam arose from it. Eithne couldn’t move. Couldn’t so much as lift a hand. Curse that old witch. Her teeth ground together at the back of her jaw. At the other end of the vast hall was a semicircular pool filled with pure, clear spring water. The pool was fully ten yards across and another yard deep. Four more of the tree-like columns with their living leaves lined the pool. Despite her frustration, Eithne felt placid and dreamy, as if she dozed in the morning sunshine of a holy day, with no daily tasks ahead of her. She’s ensorcelled me. Even the thought of it had no force, no rancor, only the bland truth of fact. She knew she should be angry. She wanted to be angry. With the wave of a hand, the high-priestess of the Drymyn Order’s sisterhood had sapped all her free will from her, and she couldn’t even protest. From her place inside the wide, arched entrance to the grotto, Eithne overheard an argument in the shadows at the far end. Corchen, the high-priestess, scolded a blue-robed novitiate. The girl’s hissed reply—“Fine, Grandmother”—told Eithne that the High-Priestess was certainly the girl’s grandmother, and that the matter was certainly not fine. The young priestess left with a thunderous look, followed by two other girls. Eithne wished she had even enough self-possession to sport such a look for herself. A strand of her copper-red hair fell across an eye and tickled her nose, and she couldn’t move it away, couldn’t even sneeze. Corchen emerged from the shadows of those strange tree-like columns, her grey-hair crowned by a spring laurel, her wrinkled hands folded on the plump belly under her stark white-robe. She took note of Eithne and raised a finger to someone behind her line of sight. Two grim-looking Huntsmen with sheathed swords and boar-head hoods, warrior-guardians of the shrine, flanked Eithne. At the center of the spring-water basin, against the wall on a pedestal, stood a white stone statue. Soft, slender, curved and graceful—the form of a beautiful woman carved in white marble. Ringed around her neck was cunningly twisted torc of silvery metal. The statue seemed fixed in place, as if it had been carved from the living rock. A soft pearly light radiated from it, illuminating the hall. From the wall on either side of the statue, spring water bubbled and cascaded down into the pool. In the pool of spring water, nine priestesses in pale robes knelt. There was something floating there between them in the water. It was a body. A man’s body. Bearded, broad-shouldered, bear-chested, narrow-hipped and naked. Blood and gore floated around him in the water. She wanted to gasp with shock, Eowain. But she could make no sound. She wanted to run to him, to draw his head from the waters and hold him. But she could make no move. Her intended husband and king, if the drymyn priests and priestesses had their way. Two of the Huntsmen took hold of her arms. Eithne felt no more sorcery or glamour then, yet the stern tone of the High-Priestess, the still strangeness of the chamber—the haunting sense of a greater presence—compelled her to silence. She watched, restrained by the two Huntsmen, as the priestesses wrapped Eowain’s ursine form in long white funereal linens. What madness is this? Eithne strained at the Huntsmen’s grip, but they pulled her back roughly. But Corchen said he lived, that he survived the betrayal of his cousin and the bandits that plagued our journey here? Anxiety clutched at Eithne’s throat, knotted her guts. She yanked again at the grip of the Huntsmen, but they were unyielding. Is he dead after all? Nine squat, ruddy-visaged brutes in hairs and furs entered the grotto from the two arched passages. They were silent as they passed between the columns, and arranged themselves in a line at the edge of the pool. The priestesses finished their work and lifted the swaddled head of Eowain up out of the pool. One of the brutes took the head and stepped back, drawing more of his body from the water. Two more brutes stepped in and took the shoulders, then two more, and two more again, until the final pair of squat little men took up the feet and together, the nine of them raised Eowain’s body over their head. Her eyes fixed on his wrapped hands. Hands that had once gathered away a spider that had startled her. Hands that had killed men that had threatened her. She wished she could hold them to herself. Her own hands clutched the air helplessly. A STRANGER IN MY STREETS. The dark brutes hefted his body up, carried it with grave ceremony to the silvery cauldron that boiled at the far end of the grotto. The priestesses, their white robes drenched with spring water and clinging to them, rose from the pool and followed after them. The plates of the cauldron had been hammered from within to push out the wyrd metal surface. From the facets of the boiling pot, mystic coelbreni runes and curvilinear pictographs stood out in the glow from the statue at the other end of the chamber. The ancient image of Kârn, god of the forest, was on that cauldron. He wore roebuck antlers and sat with goat-legs crossed beneath him. In his right hand, he held a torc, and with his left gripped a horned serpent behind the head. To the left was a stag with antlers similar to those of the god. Dogs, cats, and cattle surrounded the scene. Some faced the god, others faced away. Between the antlers of the god was the motif of a tree. The antlers of the god reminded Eithne of the massive rack that hung over Eowain’s hearth in Dúnsciath. That seems so long ago and far away now. How strong and fierce and handsome he looked. And now… Tears welled into Eithne’s eyes, no matter the guards, the people. Helplessness and defeat overwhelmed her. The brutes raised Eowain’s linen-wrapped body high in the air. The cauldron bubbled with herbs and mystic roots. On another of its plates was the bust of a torc-wearing woman, flanked by two six-spoked wheels and what seemed to be two elephants and two fierce, winged gryffins. Beneath the the woman’s bust was the image of a terrible lion. The ancient chants of Corchen and the priestesses rose in a feverish spiral through the grotto. Eithne shrieked a little as his linen-wrapped body sizzled into the scalding water. She had not thought it possible, for those short men to reduce his whole, bearish, war-like body, his whole life, into that cauldron. It seemed not nearly so vast as to contain the man she’d come to love. And yet they raised him over their heads and folded him down into the waters until he was submerged. His body, wrapped in sodden linens, gleamed with a spring-green pallor in the shadows, as the waters of the cauldron boiled, bubbled, toiled, and troubled. Then the linen-wrapped form stood up from the cauldron. Revulsion clutched at her throat. How—? But—? Even if he had not been dead before, surely the boiling cauldron had killed him. Eithne yanked again at the grip of the Huntsmen. She had to go to him, to pull aside the linens and see his face, to prove to herself it was truly he that arose from those scalding waters. Corchen spoke urgently. “Now. Get him out of there. Get him upstairs.” The priestesses helped him from the waters, the short brutes carried the bandaged body away. Want to learn more? Check out the book page on my website.